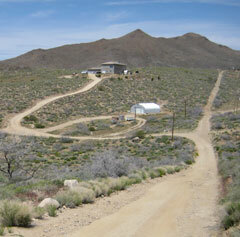 Our facility at Chloride, Arizona is located outside town on 15 acres. It’s accessible by car, but the terrain is a bit rough. Having the road paved someday is on our to-do list. We are open to visitors most of the year by appointment only. Please call (928) 565-9009 or (702) 340-1121 to schedule a visit. The main building is approximately 6,500 square feet. 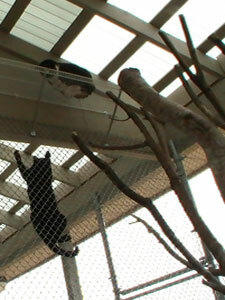 There are living facilities within the main building that also houses the cat runs. The cat runs consist of 7 large indoor/outdoor rooms. Cats can move freely between the indoor and outdoor spaces. 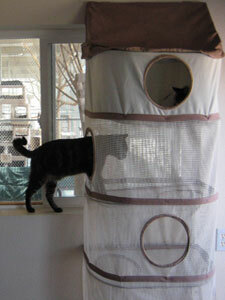 Indoors and out, they have furniture, cat beds, and cat towers to lounge on. Maureen believes it is important to make these spaces feel like actual homes. This situation is more comfortable for the cats and makes it easier for them to adjust to a “normal” home if they are adopted. 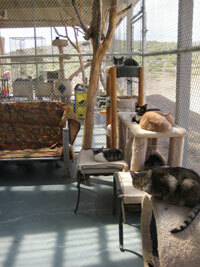 In the outdoor rooms there are tree sculptures to roost in, cat towers and tunnels and other play zones. These fenced areas allow the cats to watch birds and lizards without getting too close to the wildlife. In turn, the fencing protects the cats from other wildlife — like coyotes and the occasional mountain lion. There are lots of plans for LOLA in the future. The interior of the building is still under construction, and the outside is badly in need of a paint job. We need money to finish the interior of the second apartment and paint the exterior of the building. We have also run out of space. All of the rooms are filled to capacity with cats. Maureen dreams of building a separate space at the sanctuary to house more dogs. For now, those plans are on hold, but several acres of land are available for a future expansion. And when Maureen and Gerard have a plan, they usually make it happen.